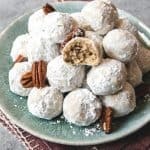 Mexican Wedding Cookies, also known as Russian Tea Cakes or Snowball Cookies, are delightfully nutty little balls of powdered sugar covered goodness! These classic holiday cookies come out every year at Christmas and everybody loves them! Preheat oven to 400 degrees F. Line a baking sheet with parchment paper or a silpat mat. In a medium bowl, beat butter and vanilla until smooth and creamy, about 2-3 minutes. In a separate bowl, whisk together the flour, powdered sugar and salt, then stir into the butter, mixing just until combined. Mix in the chopped pecans. Roll dough into 1 inch balls, and place them 1 inch apart on the prepared baking sheet. Bake for 10-12 minutes until lightly browned on the bottoms. Remove from oven and wait just until they are cool enough to handle but still warm, then roll in powdered sugar and transfer to a separate plate of baking sheet. Wait until cool, the roll in powdered sugar again to generously coat.